With its beautifully rounded curves and edges, this Amish Sleigh Sofa Table has ample space on top for convenience with an additional 46" shelf space below. It looks great behind a sofa or prime seating area, allowing for drinks, remote controls etc. to never be more than an arm’s reach away. 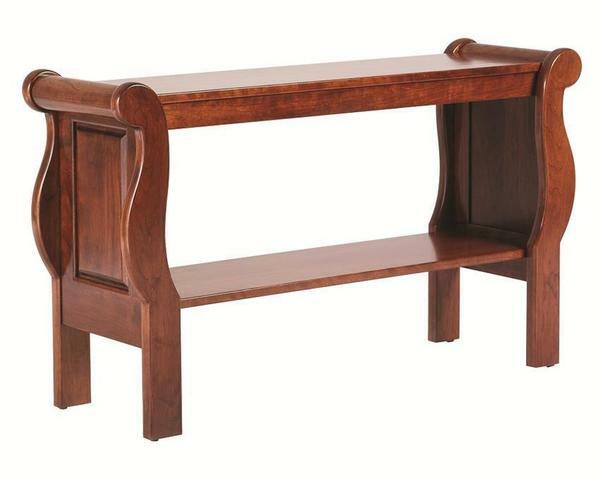 Through its versatility, our sofa table will guarantee to be a staple piece that you will enjoy through the ages. Personalize this piece to match you vision with your choice of wood and stain. For more information on this, please call to speak with a DutchCrafters Amish furniture specialist at 1-866-272-6773.